By contrast, Stephanie Czekalinski reports “Eighty-four percent of adults have higher family incomes than their parents did at the same age. And when you look at those on the bottom and in the middle, the outlook is even better: 93 percent of Americans whose parents were in the bottom fifth of the income ladder and 88 percent of those in the middle fifth have a greater family income as adults.” (Most Americans Do Better Than Their Parents, National Journal, July 14, 2012). 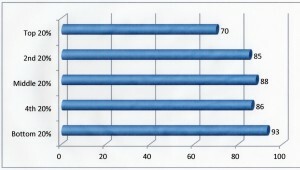 parents by income group in which they were raised? Suddenly we have two opposing views extracted from the same data. Are the poor folks doing well, or do they continue to suffer the inequities of working for a living? These confusing interpretations are reminiscent of the infamous report from space “Houston, we have a problem”. Some folks say we have a problem, and others say we are doing great. Research, by its nature, should be designed with as few biases built in as possible. This Pew Charitable Trusts report is entitled Pursuing the American Dream: Economic Mobility Across Generations. It is a carefully designed study to allow income comparisons of parents and the children raised within their households. This research design is a rare and unique longitudinal study started with select families in 1968 and is based upon follow-up using the same households’ offspring in 2009, 40 years later. To make the data as comparable as possible adjustments were made for inflation and family size. The original report’s findings include the following primary findings in a single table. Each column below from left to right shows the original family’s level sorted by income quintile in 1968. 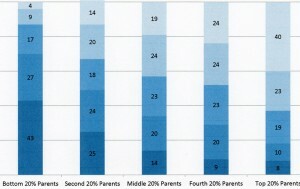 The bottom 20% parent income earners are shown in the left column, and the top 20% parent income earners are in the right column. Within each column is shown the distribution of their offsprings’ income quintile at the same age 40 years later. This is a visual display of income mobility comparing two generations. The parents are fixed left to right, low to high. The offspring are distributed within each column using the equivalent income quintiles 40 years later. If there was no income mobility from parent to offspring, the poorest parents offspring, left column, would be entirely dark blue, 100%. It is only 43%. If the richest parents offspring earned the same as their parents, right column, this column would be entirely light blue. It is only 40%. Instead, 57% of the poorest parents offspring and 60% of the richest parents offspring moved to an income level other than their parents. The poor offspring got richer, and the rich offspring got poorer. But wait! That is not exactly what our journalists’ reported. It is this contradictory pattern that both intrigues and provokes wild interpretations. Indeed Pew’s own writers focus upon the lower left 43% of low income offspring as being likely stuck there. To the contrary, the most likely outcome is the 57% who moved to a higher rung of the income ladder in a single generation. Not a single journalist mentioned that the offspring of high earning parents migrated to lower income levels. Strange!! There must be some strong tendency to focus upon a single cell, the 40% cells, in order to justify the phrase being stuck there. This half-empty statistical interpretation refuses to acknowledge a greater likelihood that the other side of the coin will prevail. While it is twice as likely that poor parents will raise poor offspring, it is three times as likely that they will move to a different level of income than their parents, for better or worse. The poor offspring are more likely to get richer, and the rich offspring are more likely to get poorer. Contrary to Pew’s own characterization of being stuck in a category, there is significant income mobility across all American family income levels based upon this study. A. It is possible to climb to the top of the income ladder in a single generation, although how far one climbs may require some unique contribution or effort. A college education is identified as one of the factors that makes climbing up the income ladder more likely. B. It is equally likely to move to the bottom of the income ladder in a single generation. From parents who are top earners, their offspring with college degrees are the most likely to match their parents. However it is more likely that the offspring of higher earning parents will drop to lower income levels, and many fall all the way to the bottom level. One of the report’s summary statements is as follows: “Pew’s latest report on economic mobility shows a mixed view. While a majority of Americans exceed their parents’ family income and wealth, the extent of their absolute mobility gains is not always enough to move them up the economic ladder.” One should add that higher earning families do not prevent the offspring from moving down the same ladder. Of curious importance is this statement’s addition of the term wealth to “income and wealth”. Income is an annual affair, a short-term concept which most wage earners understand. All short-term concepts have a half-life, and the very mobility shown in this report supports the fragile nature of income across two generations. This study supports the conclusion that significant mobility in income, both up and down, are likely from generation to generation. Wealth is one long-term possibility of those who live within their means year after year. This is easier with the higher income levels. What is most surprising is that income mobility has such a high degree of availability to the offspring of all American families, regardless of the earning level of ones own family. There seems to be a large element of freedom and choice available to those who may prefer a different income level than their parents. This applies at both the top and bottom of the originating family’s income ladder. The Pew writers reference to income and wealth suggests that they are tied closely to each other. One may generate high annual earnings, but because of largely independent factors, wealth is not the direct byproduct of high earnings or income. Wealth is the long term accumulation of assets from investments which grow over time, often over several decades. The Pew Charitable Trusts recently reported a fascinating 25-year study of the growth of wealth in America. As usual liberal journalists distorted these findings to suggest that the American dream is quickly evaporating. To the contrary, the American dream remains both alive and well. Wealth in America has become elusive for the younger generations primarily because they have not learned to manage debt appropriately. A companion paper, From Poverty to Wealth, is a comprehensive prescription for growing wealth in America. This outstanding Pew report on income mobility focuses upon those Americans who understand, and believe that it is through working and earning a living that one gets ahead. What the report does not focus upon is the large mass of Americans who believe in entitlements through government programs. Almost half of our current population is not represented in either of the Pew reports on income or wealth. They are living on the fat of the land, the taxpayers who work, earn a living, and may accumulate wealth over a full lifetime. The one group identified in the mobility report that did not perform as well as their parents was black Americans. When 70% of black babies are born out of wedlock, and most black mothers never get married, is it any wonder that overall income has decreased for this racial group. Voting as a block for the democratic party, getting ahead by endorsing this party and its cradle to grave mentality has not worked out very well over the past 25 to 40 years. Some very different and ambitious black folks still manage to do very well in spite of this cultural graveyard. Working is one of the first steps up from the bottom. Rags to riches is both alive and well across America. It would be more accurate to say it is a fiction primarily in Hollywood, in Washington DC, for liberal journalists, and particularly among black folks who support the Democratic Party as a block. Surprisingly, it is precisely this mobility across income levels in a single generation that is the reality from this Pew Charitable Trusts report. Some will never see the light, and fewer will report it! !